Cars are a defining feature of cities as we know them. Sometimes we are grateful for the mobility that cars provide. Frequently, though, we lament the effects of cars on our cities, from air and noise pollution to traffic jams, safety hazards, and the exclusion of more environmentally-friendly forms of transport. Hwaseomun Street, the main arterial shopping street once primarily for cars, was transformed into a street exclusively for pedestrians and ecomobile vehicles. © Suwon City Council. We might often wonder, then, what our cities would look like without cars. In September 2013, one neighborhood in Suwon – a city in the Republic of Korea – found out. Located 30 kilometers to the South of Seoul, Suwon has over one million inhabitants. It is a member of the EcoMobility Alliance, and in 2013 it committed to hosting the first EcoMobility World Festival. As part of this festival, the city agreed to remove all automobile traffic from the neighborhood of Haenggung-dong for the month of September. This huge undertaking required extensive planning. In order to ensure all inhabitants were involved in the project, city officials conducted door-to-door visits, explaining the Festival objectives and recording the comments and suggestions of each household. 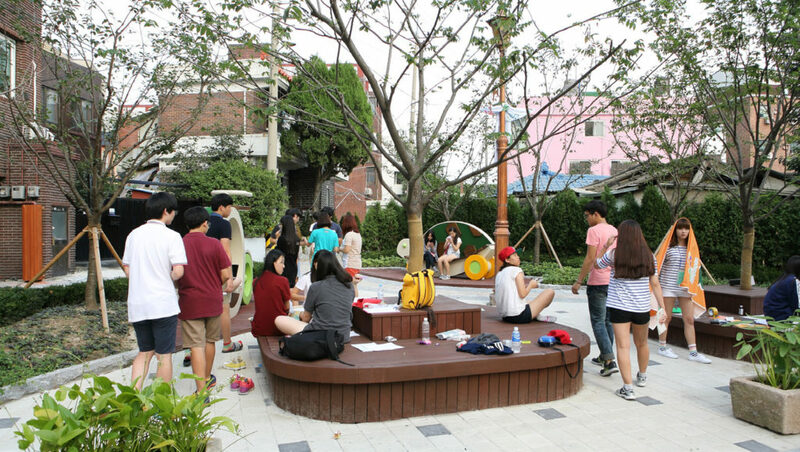 Following the consultation process, Mayor Yeom embarked on a neighborhood regeneration program that focused on transforming the area into one that prioritized people-oriented environmental sustainability and accessibility. Four parking lots were allocated to residents outside of the neighborhood, with a 24-hour electric car shuttle also provided. Alongside logistical preparations, community artists painted a series of decorative murals, adding vibrant local character to the newly designed streets. Streets were leveled and repaved, and former parking spaces and lots were designated as pocket parks, bicycle parking, and public spaces for residents to use and enjoy. residents to enjoy. © Suwon City Council. Despite initial resistance, the initiative was a huge success. Residents made use of a range of mobility options, including a variety of bicycles (upright, tandem, recumbent), pedelecs (electric assisted bicycles) and velo-taxis. Additionally, over 20 different companies from around the world showcased their ecofriendly vehicles, which were rented, free-of-charge, to residents and visitors. Upon the completion of the pilot project, the municipality and its citizens could choose to convert the neighborhood back to its earlier form, with cars dominating streets and public space, or to make the transformation of space and infrastructure wholly or partially permanent. Approximately 300 participants collaborated to devise speed limits, parking controls, and one-way streets. They also called for the project area to be extended to include the entirety of Haenggung-dong. The success of the EcoMobility World Festival showed that dramatic change is possible when all stakeholders are involved in decisions and when local governments are fully engaged. However, neighborhoods keen to replicate this initiative must be prepared to meet logistical challenges and to compromise where necessary. For one month, Suwon offered some of its residents what many of us dream about. Their experience should inspire us to pursue our own EcoMobile future. Note: Suwon will share the outcomes and lessons of their EcoMobile experience at the ICLEI World Congress 2015 to be held on 8-12 April in Seoul South Korea.